What are the Benefits of Therapy Dogs in the Workplace? As a therapy dog organization, we know the benefits of having therapy dogs in the workplace. Having a therapy dog in the workplace can have multiple benefits. Some of the most successful companies in the world welcome therapy dogs on their premises. Companies such as Google, Amazon and Ben & Jerry’s have been recognized for their work culture and employee friendly policies. Other businesses that utilize therapy dogs are the Build-a-Bear Workshop, that has Milford the Chief Executive Dog, and P&G Petcare that “employs” Euka, Vice President of Canine Communications. In this article, we will discuss how therapy dogs can relieve stress in the workplace, boost morale, and provide a model for teamwork. How Do Therapy Dogs Reduce Stress in the Workplace? According to a Virginia Commonwealth University study published in Spring 2012, “employees who bring their dogs to work produced lower levels of the stress-causing hormone cortisol.” The study was conducted at a dinnerware company in North Carolina, which sees 20 to 30 dogs a day on its premises. As the workday went on the research found average stress level scores fell about 11% among workers who had brought their dogs to work, while they increased 70% for those who did not. The study also found that pets triggered workplace interactions that would not normally take place. Little things like petting a therapy dog can increase levels of the stress-reducing hormone oxytocin and decrease the production of the stress hormone cortisol. Studies have shown that stress reduces productivity. Studies have also shown that a therapy dog’s loving boost can help increase productivity as the stress diminishes. Therapy dogs can help employees feel more resilient at dealing with stress and lessen their reactions to stressful situations. Lower stress equals lower blood pressure and fewer heart problems. How is that related to workplace productivity? Employees who are healthier take fewer sick days, need lower health insurance premiums and contribute better at the workplace than those who fall sick often or suffer chronic health issues. Havill explained that touching or petting an animal has been shown to lower the galvanic skin response much like the science behind the polygraph test when measuring feelings such as fear, stress or anxiety. Reaching down and petting a dog is an easy way to ratchet things down when you need to. What Should I Know Before Bringing My Therapy Dog to a Workplace? Bear in mind that should you be allowed to visit a workplace with your therapy dog, following ATD’s procedures, no one other than the handler can take control of the leash. Therapy dogs must be on-leash and remain under control while visiting with people in the workplace. If you are bringing your dog to your workplace during your normal work hours, ATD insurance will not be in effect. If you are doing an ATD visit with your dog in someone else’s workplace, or at your own workplace when you are not actually being paid to work, ATD insurance does cover you. How Can a Therapy Dog Boost Morale in the Workplace? It is nearly impossible to look at a picture of a dog and not smile or laugh. Laughter is the best medicine and a therapy dog adds just the right amount of humor to boost employee morale and increase workplace productivity. Therapy dogs can lift moods, improve happiness and reduce stress. All the benefits of owning a dog at home translate to the workplace with a therapy dog by their side. How Do Therapy Dogs Encourage Teamwork in the Workplace? Companies spend countless labor hours and dollars on planning and implementing team-building activities. If the presence of dogs in the office can enhance cooperation, why not choose that option and save resources? It is rare for a workplace to be without some type of conflict or drama. There are many instances where workers feel like they cannot relate to one another or have a hard time feeling empathy do to a lack of shared interests. The introduction of a therapy dog can help generate workplace interactions that would not normally take place; it encourages dialogue as employees share favorite memories of their pets. This commonality helps employees feel more connected to one another, and therefore more willing to operate as a team. Therapy dogs are communication energizers and tend to spark conversations between employees. Employees who typically did not talk to one another before, are now more engaged. The benefits go far beyond just reducing worker stress. Businesses that have policies allowing therapy dogs reported that employees perceive these policies as organizational support. The feeling that the employer cares about the employees’ personal and professional development decreases the turnover rate with more job satisfaction. Job satisfaction seems to be hard to come by these days. Slowing down does not seem to be an option for many of us. The reaction of employees when they encounter a therapy dog is overwhelmingly positive both for both mental and physical well-being. Therapy dogs offer employees the opportunity to increase productivity while creating a relaxed, therapeutic atmosphere. Therapy dog policies were shown to not only help companies retain current employees but to recruit new hires as well. Two out of three therapy dog-friendly companies say that potential candidates often inquire about pet-friendly workplace policies during the application and interview process. Further, nearly 80 percent of the companies reported that they often proactively discuss pet-friendly workplace policies as a potential benefit to boost recruitment. The benefits of a therapy dog in the workplace are impressive and companies that employ therapy dogs rarely cancel the service. 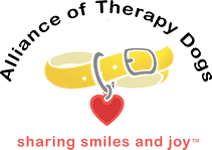 If you are an employer or employee and would like to learn more about how therapy dogs can benefit your workplace, contact The Alliance of Therapy Dogs.